Hair loss for a woman can be devastating. The problem is increasing every year and is estimated that 6 out of 10 women will suffer a degree of hair loss. Most people think that it only men who suffer from hair loss but that is not the truth. No matter what your age or stage of your hair loss, our area of specialism is the treatment of hair loss here at the ShadiDaninMedi-Spa. ShadiDanin has over 20 years’ experience in scalp, hair loss and works with the most advanced hair and scalp preparation research by doctors and biologist all over the world and has client travel from afar. One in four women experience hereditary hair thinning. Female pattern alopecia – Hair loss occurs over the entire scalp and is genetically inherited and usually from either mother or father side. Telogen Effluvium –Effluvium, blood thinners, seizure medication, medication for gout, blood pressure medication, anti-inflammatory drugs, medications that lower cholesterol, mood altering drugs, thyroid medications, miscellaneous medications such as diet pills, high vitamin A dose and street drugs (cocaine). 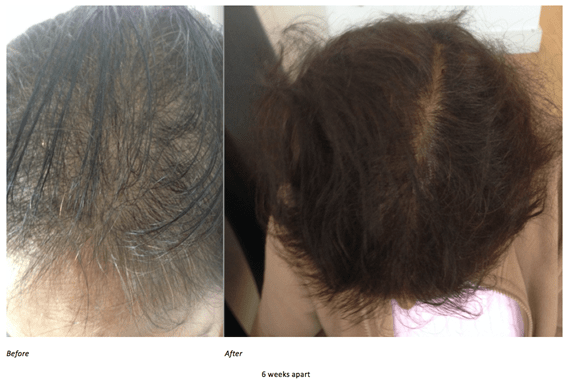 Anagen Effluvium – Chemotherapy and radiotherapy. AlpeciaAreata – A genetic auto-immune disease. Scarring Alopecias – Cause by a variety of dermatologic or medical conditions such as Lichen Planus, Discoid Lupus and infection also can be cause by local radiation therapy. Senile Alopecia – Hair will thin over the time and is usually related to a person genetic make-up. Medications – Blood thinners, antidepressant, birth control pills, high blood pressure, gout. Diet – too little minerals and vitaminsdeficiency or high dose of vitamins A. Child birth – A small number of women suffer from hair loss usually three months after birth. Excess colouring – The chemical travelled up through the hair shaft and get under the surface, killing the hair follicle. Bleaching – A BIG NO, bleaching your hair is extremely destructive to the hair structure. Lack of sleep/stress – Severe illness, emotional stress and surgeries, the body shuts down the production of your hair during your stress period. Thyroid disease – over active or under active thyroid it can make your hair become thinner and start to fall out. Shadi footnote: I am delighted that I have been able to help this lady and many others. Laser Hair Therapy– A completely painless laser in which over 95% of patients experience re-growth and upto 50% increase in blood flow to their scalp. 100% of women had stablisation of hair loss and stops further hair loss almost immediately as well as an increased in thickness of the thin hair. 13 minutes treatment.